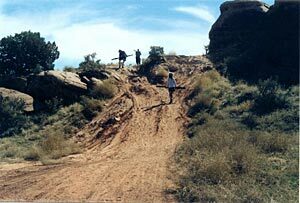 Moab contain outstanding scenic, biological, and archaeological resources. These resources, which are the reason visitors come here, are in danger of being destroyed by too much visitation. 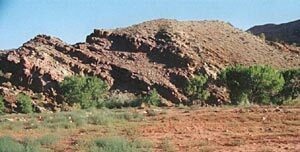 Protective cryptobiotic soil crusts and vegetation are trampled, soil has been lost to erosion, desert streams are polluted, archaeological sites are being damaged, and wildlife habitat has been lost. Public land agencies do not have enough staff or funding to deal with these problems. Plateau Restoration stepped forward and offered to help restore lands damaged by recreation use. 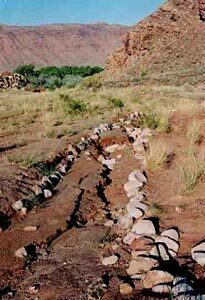 The work done by Plateau Restoration is critical. Perhaps equally as important, the volunteers they supervise learn about the kind of damage recreationalists inadvertently cause, and these volunteers become stewards of the public lands”. Plateau Restoration was founded in 1995 to assist public land managers in their efforts to maintain a vital and healthy landscape. Volunteers under our professional leadership have contributed tens of thousands of hours to public lands. Our staff members have significant experience as government employees in recreation and resource management on the Colorado Plateau. Projects are planned with resource managers in advance and conducted with our tools and equipment, leadership and follow-up, without requiring direct agency supervision during project work. This allows agency staff to complete other vital tasks while we complete these pre-planned projects. Many of the projects we have conducted have been initiated by us and funded largely by foundation grants that we have secured. National Fish and Wildlife Foundation, the University of Idaho and member contributions. 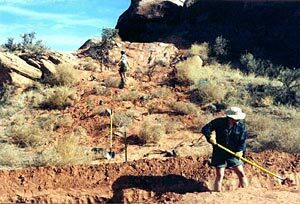 We have worked on several large, multi-year revegetation projects on BLM lands in southeastern Utah: these include Mill Creek, Moab, Sand Flats Recreation Area, Moab, Ken’s Lake, Moab, and Sand Island Recreation Area, near Bluff, UT. Photos below show the Mill Creek area in 1996 after closure of the area to vehicle use and camping, as a weed-infested wasteland prior to our restoration efforts (left). Currently (right) there is a healthy upland community of native grasses and shrubs. Funding for the project has come from the BLM, National Fish and Wildlife Foundation, Utah Division of Water Quality, Utah Power, University of Idaho, and member contributions. 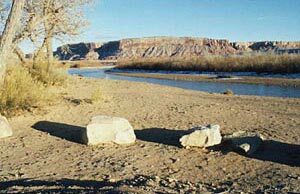 We also initiated a long-term project at the BLM Sand Island campground on the San Juan River, near Bluff, UT. In 1997, the BLM performed various measures to stabilize the riverbank at this popular river launch site. The construction resulted in removal of a number of cottonwood trees and most of the upland vegetation within a two-acre area adjacent to the boat ramp. The project has included installing a fence around the two-acre site to protect it from cattle grazing, removing weeds, installing a drip-irrigation system, designing an interpretive trail system, planting with a variety of native trees and shrubs and installing educational kiosks. 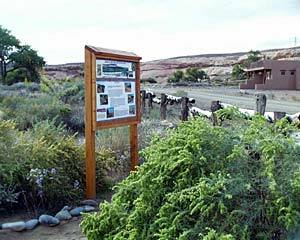 The long-term goal for this project site is to have an example native vegetation area with interpretive trail to educate visitors about native habitats and invasive weeds. Photos show the project site immediately after heavy equipment work and the same area in 2003 (right). Support for this project has come from the BLM, Utah Division of Water Quality, University of Montana, Mankato State University, International Adventure Tours, National Fish and Wildlife Foundation, Canyonlands Field Institute’s Elderhostel and Graduate Student participants, and member contributions. We have since then planted hundred of cottonwood trees throughout the site and helped install an irrigation system to water the trees. We have conducted a number of weed management projects involving Tamarisk, Knapweed, and other exotic species. 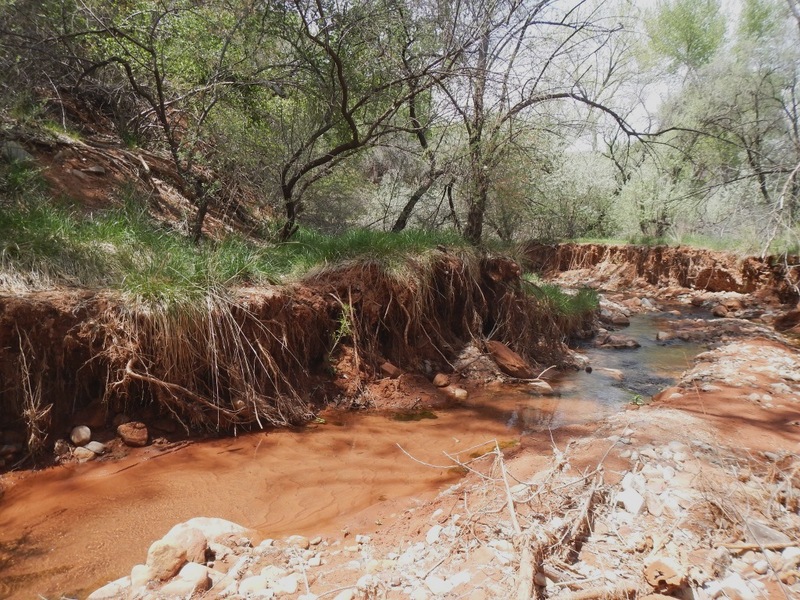 Projects involving manual removal of Tamarisk, an invasive exotic species that threatens water sources have been conducted at several spring sites in the Moab area and in Lower Courthouse Wash, Arches National Park. Trees have been hand dug and cut below the root crown to prevent re-sprouting. These efforts to reduce or eliminate tamarisk adjacent to perennial water sources without the use of herbicides have thus far been 100% successful. In a community-based project in Castle Valley near Moab, UT, we have been involved in manual removal of diffuse knapweed to minimize the need for herbicide treatment, especially near surface water. A short-lived invasive exotic perennial, we expect to have knapweed reduced to a level that can be controlled by biological agents within a few years. 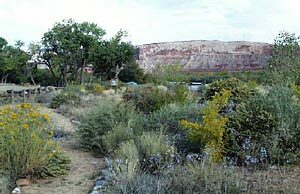 We worked with the State of Utah to control non-native Russian Olive trees growing along the Colorado River downstream of Moab. Using an innovative method of frill-cutting and applying Roundup, the trees are left standing and continuing to provide habitats for several years as they slowly die. Some of our earliest projects included mitigation of erosion problems and social trailing on hiking trails, including at Mill Creek near Moab (pictured here) and at the Kachina Panel on the San Juan River. 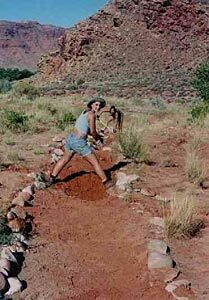 Our students also help with the building of the hiking trail system at Ken’s Lake, south of Moab. With the help of dozens of students, we have been planting willows and other riparian shrubs and trees along the bank of Castle Creek in Castle Valley to help stabilize the bank of the creek, reduce sediment load and therefore improve water quality of the creek.